- In early versions of the game, type "ken" on the first screen of the game. Ken Williams will appear, complaining how the game was behind schedule. This has been eliminated in later versions. 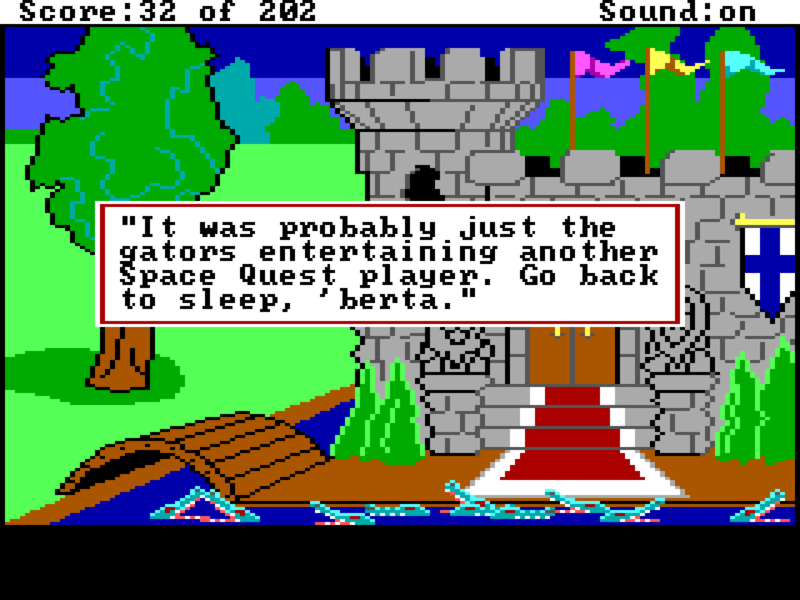 - When you press the "don't touch" button in the escape pod, you'll wind up in King's Quest 1 and Ken and Roberta Williams commenting about another Space Quest player being eaten by the gators in the moat. Read the wall in Vohaul's toilet to find sentences such as "King Graham cross dresses", in reference to the King's Quest series. There is also a reference to Al Lowe and Ken Williams. The patron in Lefty's bar, sitting to the left of Larry, is Ken Williams. The password to access the pimp's room in Lefty's Bar is a reference to Ken Williams. Ken makes another appearance at the very end of the game, announcing a new Leisure Suit Larry coming up. When Larry waits to get a seat at the restaurant, the receptionist first lets all the rich people pass and take a seat, including Mr. and Mrs. Gates (referring to Bill Gates of Microsoft) and Mr. and Mrs. Williams, referring to Ken and Roberta Williams, founders of Sierra On-Line. Hey, you're that guy from Lefty's! Ken Williams makes cameos in all of Al Lowe's Larry games, and Larry 2 is no exception. Chief Keneewauwau, father of Kalalau, is a cameo of Ken Williams. Chairman Kenneth of Natives Inc, who was formerly chief Kenneewauwau in Leisure Suit Larry 2, Larry's dad in law, is a cameo of Ken Williams. In the programming cubicles at ScumSoft, there are two guys walking up and down, whipping the workers. These are Ken Williams and Rick Cavin, who was head of production at the time. 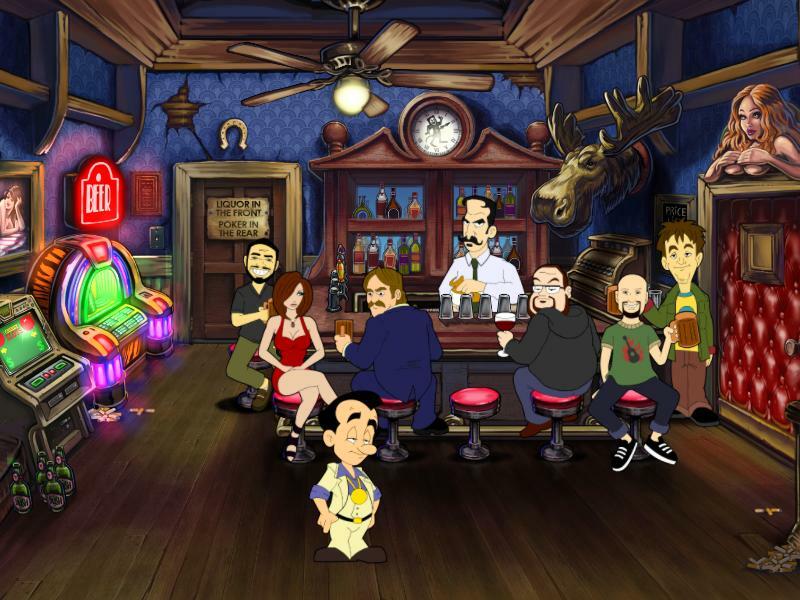 Ken Williams makes a second cameo at the very end of the game, promoting other games in the Leisure Suit Larry series. Ken Williams as usual made a cameo. Here you find him floating in the pool at the bar. As with practically any Al Lowe game, Al put in a cameo of Sierra founder and CEO Ken Williams. In Freddy Pharkas, Ken has the role of Kenny the Kid. When looking at your desk in your office, look at the desk to your left for a reference to Ken Williams, founder of Sierra On-Line (who indeed moved to Seattle when Sierra opened its new headquarters there).